Compass Blinds and Shutters have some simple objectives when it comes to how we conduct our business. Excellent customer care, top quality blinds and timber shutter products and all delivered to our customers with genuine attention to detail and skill. Compass Blinds & Shutters has two distinct sides. Firstly we are manufacturers and suppliers of a very large range of blinds. Everything from a simple roller blind right up large commercial motorised systems. The other side to our business is our main agency for S-Craft timber Shutters in the North-East, covering Louth, Meath, Monaghan, Cavan and parts of North County Dublin. 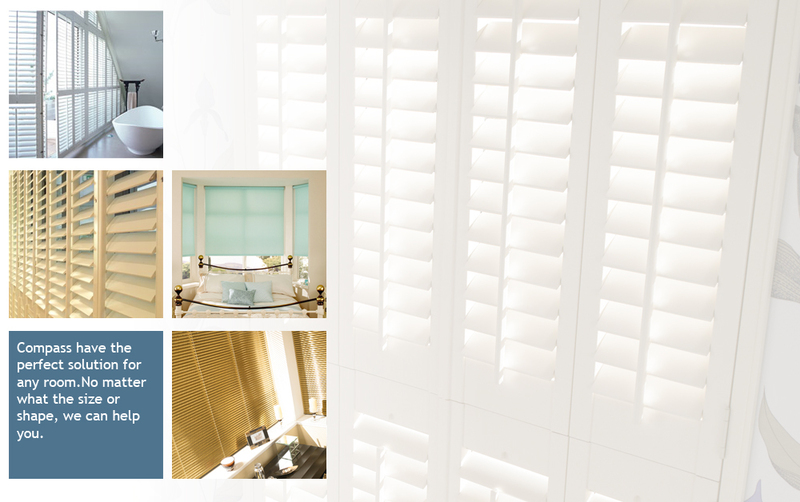 S-Craft Shutters are the largest suppliers of quality Timber plantation shutters in the UK and Ireland and supply retailers such as John Lewis who have 48 stores and a number of other top retailers. S-Craft is a genuine premier branded product and carries a 3 year warranty. Their choice of Timbers, frame options and paint and stain finishes is by far the largest on the Irish Market and their manufacturing techniques are not found in any other timber shutter product in Ireland. Compass Blinds and Shutters bring this same level of workmanship, quality and professionalism to all our products. We work within our customers budgets but never at the expense of the final installation.